It takes a strong, sustainable and competitive advantage business model for a company to raise its dividend each year for over 25 years and even during recessions. Hence, the Dividend Aristocrats should be one of the most recession-resistant stocks around. So that is why we have analyzed the last recession period, the years 2007-2009. Wall Street is now in the longest bull market in history. More and more the question is raised when the recession will start. So let’s have a look how the Dividend Aristocrats performed during the last recession years 2007-2009. Higher total returns with lower volatility are often mentioned as typical characteristics of the “recession-resistant” Dividend Aristocrats. Looking back, the Dividend Aristocrats, have indeed (historically) shown smaller draw-downs during recessions versus the S&P 500. 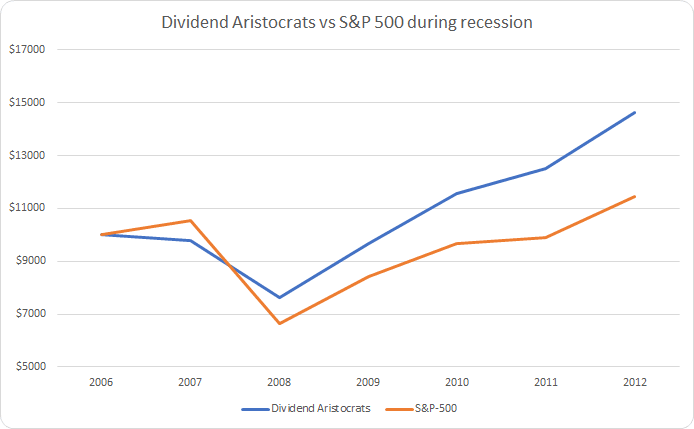 For example in 2008 the Dividend Aristocrats Index declined 21.9%, compared to the S&P 500 declined of 37%. Also the in 2002 the dividend aristocrats declined by -9.9% while the S&P 500 showed a negative performance of -22.10%. 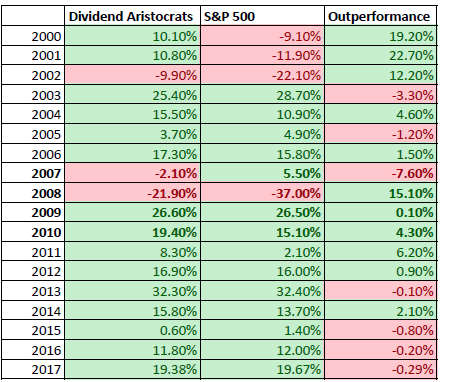 When we focus on the time-frame 2007-2010, the draw-down is indeed less (+15.10% versus S&P 500), which also has the effect that the Dividend aristocrats have recovered faster from this negative performance. Our performance triangle of the Dividend Aristocrats shows the average annual returns for any investment periods, ie combinations of buy and sell times on an annual basis. The “year of buy” is plotted on the horizontal axis and the “year of sell” on the vertical axis. Whatever investment period you take, a maximum of three years gives a negative performance. In the chart below, it becomes clear that an investment of $10,000 in the Dividend Aristocrats by end of 2006 is “back on track by mid 2010. However the same investment in the S&P 500 will need till 2012 to get back above the original investment of $10,000. By end of 2012 the Dividend Aristocrats investment would have been $ 14,632 versus $11,461 for the S&P 500. See also dividend aristocrats performance per year.